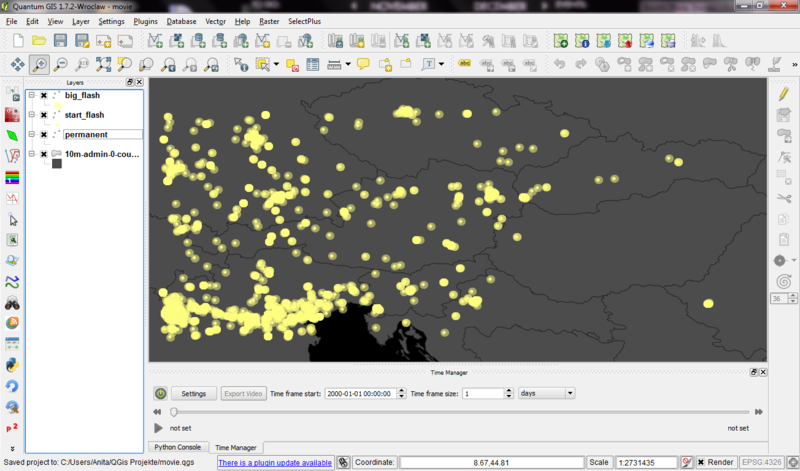 You probably know this video from my previous post “Tweets to QGIS”. Today, I want to show you how it is done. After importing the Twitter JSON file, I saved it as a Shapefile. Every point in the Shapefile contains the timestamp of the tweet. Additionally, I added a second field called “forever” which will allow me to configure Time Manager to show features permanently. A "forever" field will help with showing features permanently. Layer “start_flash” is a medium sized dot that marks the appearance of a new tweet. Layer “big_flash” is a bigger dot of the same color which will appear after “start_flash”. Layer “permanent” is a small dot that will be visible even after the flash vanishes. We’ll plan the final animation with a time step size of 10 seconds. That means that every animation frame will cover a real-world timespan of 10 seconds. Layer “start_flash” starts at the orginal time t. Layer “big_flash” gets an offset of -10 seconds, which means that it will display ten seconds after time t. Layer “permanent” gets an offset of -20 seconds and ends at time forever. Layers can be timed using the "offset" feature. Use a time step size of 10 seconds so it fits to the offset values we specified earlier. Time offsets are a new feature in version 0.4 of Time Manager. 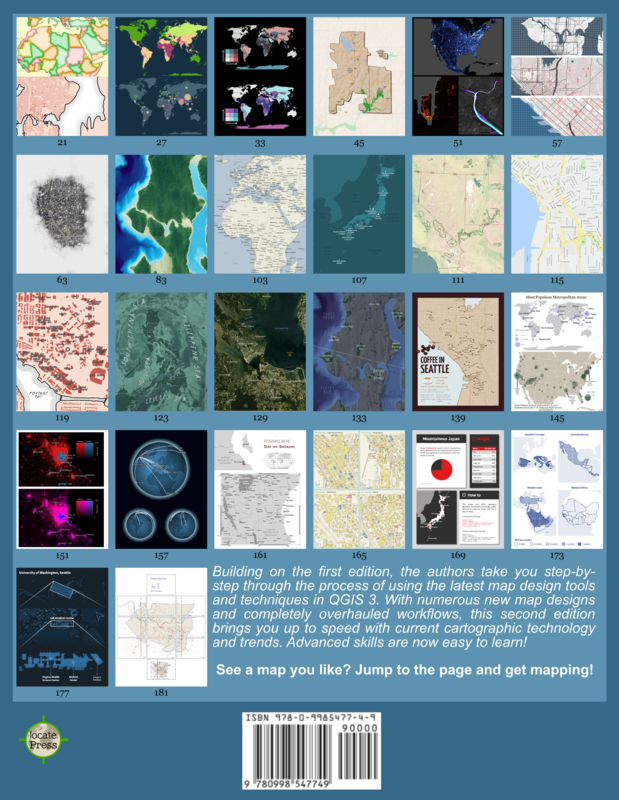 You can get it directly from the project SVN and soon from the official QGIS repo. Thanks Dassouki! My first idea would be to have one point per city and time interval. The number of tweets could be used as a size scale field for the city symbol. I’m not sure if normalization is really necessary. I’d give it a try without first. Great idea by the way! Are you working on something like that? Very cool stuff, thank you.I am testing it as a visualization / presentation tool showing infrastructure maintenance schedules. My time data is over 3 years so trying to get the right interval settings for the best impact – any suggestions? That would depend on how long a single maintenance task takes and how many of them you have within this 3 year period. Also, what kind of effect do you want to achieve? Should it look like there is something going on all of the time? I find that it usually takes quite a while to find a combination that works for me. The offset is meant to be on the date timeline and it has to be specified in seconds. The offset will depend on your time step size. (In the example I had a time step size of 10 seconds and offsets of -10 and -20.) Are you showing one day per time step now? I am trying different scenarios using various steps sizes and offsets. I am going to apply it to the phased construction of a water reticulation scheme so that the video will show the planned schedule for pipes, dams and boreholes. I think it will be very useful when presenting our results to non-technically minded stakeholders. Sorry for being a bit thick but I’m trying to animate daily events from a 10-year data set (of 25k records) but couldn’t get it done properly. My offset is -86400 (1 day). What am I supposed to adjust to view this properly? Ignore my last comment. It was stupid of me not to push the “play” button. I am using TimeManager to animate some arrival and departure events over a 24hour period. 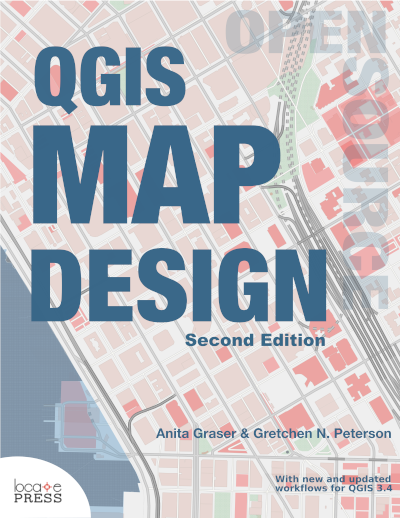 I checked the box to display the time on the map but it is appearing behind the QGIS copyright information in the bottom right corner. Any ideas how to get around this? Great tool by the way!! Ignore my question…I found the answer! For this use case you don’t need any offset. You can leave the field empty. when i click on the play button i can’t see my points showing up on the map, it’s all blank from the beginning to the end. But i can see than the dates are those that i have on the csv file ( from 2012-04-01 to 2012-04-01 ) . Time framesize 1 day. Offset = 0. show frame for 200 milliseconds. May be i am doing something wrong ??? All the settings sounds reasonable. If you turn TimeManager off, do you see all the points? Is there a way to have a bigger time stamp on the map? I’m generating a video to be presented on a beamer, and this is too small.